Stat-Ease makes it easy for you to perform statistical design of experiments (DOE) with Design-Ease® or Design-Expert® software. Design-Ease offers multilevel factorial screening designs to help you find the critical factors that lead to breakthrough improvements. Trade up to Design-Expert for more in-depth exploration. Use response surface methods to optimize your process or mixture. Display optimum performance with terrific 3D plots. 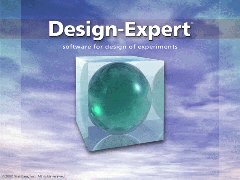 Design-Expert is a comprehensive DOE tool with all of the features of Design-Ease, plus much more! Identify the breakthrough factors for process or product improvement. 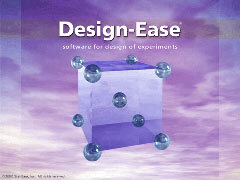 Design-Ease software helps you set up and analyze general factorial, two-level factorial, fractional factorial (up to 15 variables) and Plackett-Burman designs (up to 31 variables). With these designs you can quickly screen for critical factors and their interactions. Reach the peak of performance with your process or formulation. Design-Expert includes all of the features of Design-Ease, plus provides in-depth analysis of process factors or mixture components. Combine mixture and process variables in your designs. Design-Expert offers rotatable 3D plots to help you visualize your response surface. Explore the 2D contours with your mouse, setting flags along the way to identify coordinates and predict responses. The sweet spot where all your requirements are met can be found via the program's numerical optimization function, which finds the most desirable factor settings for up to 12 responses simultaneously!